Lake Emu is a flood lake on the Darling River in far west New South Wales in Kinchega National Park. 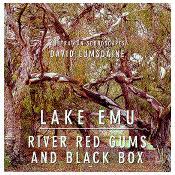 River Red Gums and Black Box were recorded at the Darling River. There is an abundance of birdlife in both places. Australian composer and soundscapist David Lumsdaine, now living in York, has a number of contemporary classical albums, but I knew him first as an excellent soundscapist. A man of many talents, he also founded and directed the Electronic Music Studio in Durham U.K., and taught at Leeds College in London. On this CD a wide variety of wildlife -- exotic birds seemingly unique to New South Wales, frogs, crickets, other insects - were recorded at sunrise, sunset, midnight and the hours in between. It includes 10 tracks which basically play continuously, and these soundscapes have a really strong sense of place. No place else on earth sounds like this!